Garmin 546s | Our an independent review of the Garmin 498C marine GPS chartplotter fishfinder and more on marine electronics. The Garmin 546s test unit we reviewed combines the capabilities of a high-sensitivity GPS receiver, mapping chartplotter, and 1000-watt internal sounder into a single unit that comes preloaded with Garmin BlueChart g2 U.S. Coastal cartography. A 500-series plotter from Garmin can be purchased in a wide variety of configurations. Here are the basics, all 500-series machines have a 5-inch display screen. Unit designations ending with the number 5 or 6, like our 546s test unit, have 480 x 640 pixel screen resolution. Model numbers ending in 0, like the 540 have lower resolution display screen that uses 320 x 240 pixels. The small s suffix in the model number indicates the unit has an internal sounder. The 500-series plotters are available with one of two sounder power outputs, units with high screen resolution also have the more powerful sounder. The middle number in the model designation indicates the type of preloaded cartography. A 5 is UK/Australia, 4 is US coastal, 3 is US inland lakes, 2 is base map only. All of these units are capable of using Garmin BlueChart g2 Vision cards. The Garmin 546s package includes the display, dual frequency transom-mount transducer, protective front panel cover, swivel mounting bracket, power/NEMA 0183 cable, ownen’s manual, quick reference guide, and installation instructions. Power and data to either of two NMEA 0183 ports pass through a single cable that fastens to the case back with a twist lock connector. An additional leg on this cable connects the supplied transom-mount transducer. When operating the 546s draws about half an amp. An optional external GPS sensor connects using a BNC twist lock. We used the standard internal GPS sensor for our testing. This unit is also fully compatible with a NEMA 2000 network. Interfacing the 546s with an N2K network would require additional hardware and setup. Flush-mounting requires an optional kit. The Garmin 546s screen measures 3-inches wide by 4-inches high yielding a 5-inch screen size when measured on the diagonal. Pixel count is a very respectable 480 by 640. We rated day viewability on the high resolution Garmin display screen excellent. With its high resolution even fine details are sharp and clearly readable. The powerful processor in this Garmin unit make the 3D presentation look good and move smoothly. When viewed using polarized sunglasses the screen does darken and become somewhat harder to see. No screen fogging was apparent in the display at anytime during our review. The Garmin 546s has two color palettes, day and night. The night palette uses darker coloration to enhance night viewing. This unit also has an automatic backlight control system that uses a sensor on the front of the display. We tried it and found it worked very well at matching the backlighting to the outside light level. I rated the 546s excellent for night viewability. This Garmin, like all others in the series, is operated with four dedicated function keys, an up/down left/right rocker, a pair of range keys, and the off/on pushbutton. With this limited number of buttons, onscreen menus play a big role in easing the user through tasks. Things get started on the Home page and go from there to one of six main pages. They include the Chart, Sonar, Chart/Sonar, Where To, Information, and Configure pages. The high-sensitivity GPS receiver in the 546s worked very well and was even able to get and hold a signal inside a metal roofed building. I tested this Garmin chartplotter fishfinder with software version 2.10 installed. Garmin adds features and fixes to software on a regular basis so if you buy one of these units get yourself a blank memory card and go to the Garmin website to find software updates. To create a waypoint at present position you hit the Mark button. The unit then shows you a the saved waypoint data and options to edit, delete, or select as MOB. Using the right arrow on the keypad takes you to a mini chart view showing the location of the waypoint. This can be a handy reminder of exactly where a point is located. You navigate to a waypoint by first selecting it from the chart or off a waypoint list. Then youd follow through a couple menu selections and execute. If youve have navigation data boxes set to automatic this will bring them onscreen loaded with information. Youll also see a course line to follow displayed onscreen. Tide data is stored onboard and can be displayed from the chart page or information menu. The Garmin 546s can store up to 3000 waypoints and 100 routes. Waypoints are identified by choosing one of 70 symbols and using up to ten characters in the name. We found the easiest way to build a route was through the Information page. Start by working your way through a few menu selections until you get the new route page, then simply place the cursor in the desired position and hit Select to create each point along the route. Routes can also be built from present position using the cursor pad and Select button. Using the man overboard function on the Garmin is a two-step process. First youd press the Mark button, then you must cursor to the MOB field and confirm with a press of the Select key. After you do this the unit creates a waypoint, switches to the chart page if youre not already on it, and opens data boxes giving navigation information back to the MOB position. The Garmin MOB function would be better if it were activated with a single button push. Screen redraws on the 546s are fast, smooth, and fairly seamless under most circumstances. The Garmin 546s chart page can be orientated to North Up, Course Up, and Heading Up. At sea it responded well in all settings. Selecting the Where To page from the Home page lets the user view locations for services, tracks, waypoints and routes. Tides, current, and celestial data is found from the Information page. All this information can also be accessed by putting the cursor over an area on the chart page. This Garmin chartplotter fishfinder has an easy to use distance and course measuring tool that can be found by simply placing the cursor and then hitting Select. The Garmin 546s is rated waterproof to IPX7 standards, which means it could be submerged to a depth of 1-meter for up to 30 minutes and survive undamaged. The unit carries a 1-year warranty. 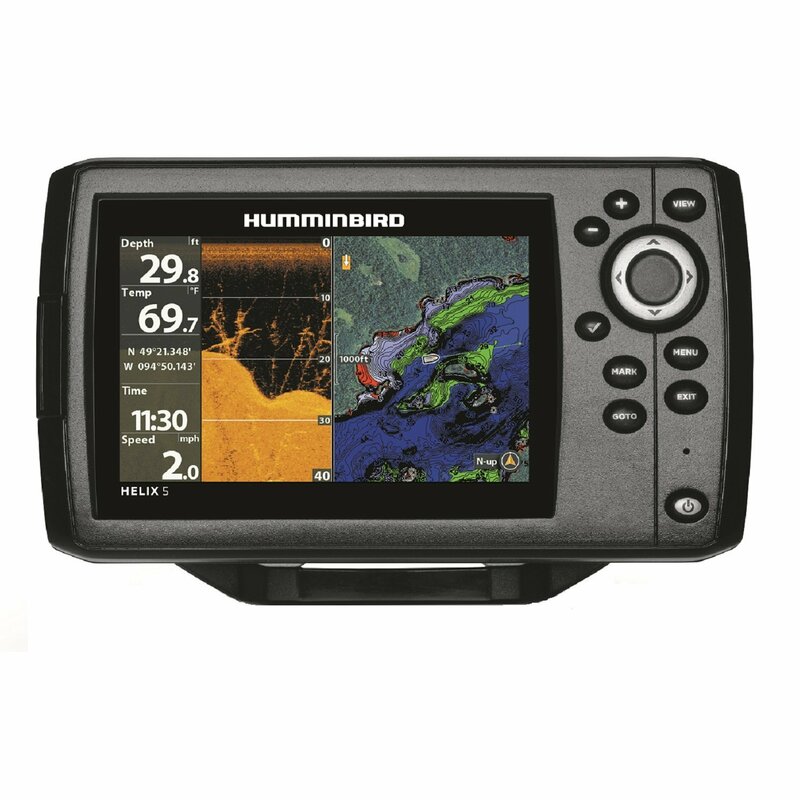 This Garmin is capable of producing up to 1000 watts of output power from its integral sonar. For my testing, I used the 50/200 kHz transom mount transducer supplied in the package. The Garmin 546s sonar painted our test targets best when we opitmized the gain setting for each frequency individually. Here you can see all three targets on both the high and low frequency display. This transducer limits the sounder output to 500 watts. To get the full 1000 watts of output power requires a transducer with a 1kW power rating. In the depths I tested the reduced power had little to no effect on the results. After choosing Sonar from the Home page menu, you can select how to display the sounder data. Options include full page sonar, a split frequency page, or split zoom. You can also choose various sounder setup options. This unit has all the features youd expect from a modern fishfinder including A-scope and bottom lock. During our testing 546s sonar marked all three of our submerged test targets best with by fine tuning the gain individually for both the high and low frequencies. Commonly changed sounder settings like gain, depth, frequency, and zoom options can adjusted as needed from the first page of the sonar menu. On this page youll also find a sonar setup option. From here you can change the settings for scroll speed, surface noise, and add a depth line. While using the sonar the plus/minus buttons can be used to manually quick change the depth setting if desired or reselect automatic depth ranging. A-scope is only available when viewing the sonar full screen, it will not appear on the sonar setup options menu when in a split screen configuration. In my opinion this fishfinder has plenty of features, was very intuitive and easy to operate, and worked well presenting bottom, fish and our test targets during our review. I rated the Garmin 546s sounder good for presentation and excellent for ease of use. Sharp screen details and excellent ease of use ratings for the plotter and sonar combine to make this Garmin chartplotter fishfinder an excellent choice for your boat. Buy this Garmin chartplotter fishfinder with a dual frequency transducer here.